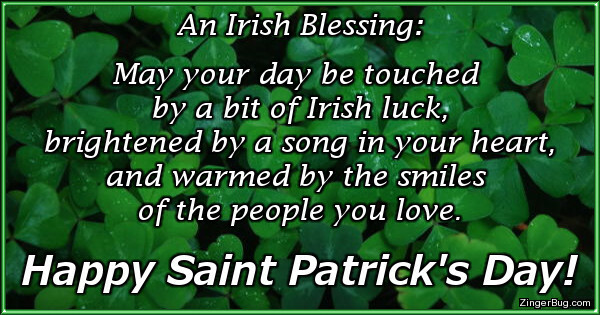 Happy Saint Patrick's Day Comments, Greetings and Glitter Graphics! Saint Patrick's day, often referred to as St. Patty's Day or St. Paddy's Day is the celebration of Saint Patrick, one of Ireland's patron saints. The holiday is celebrated on March 17, and has been an official national holiday in Ireland since 1903. It is also recognized by the Catholic church. Saint Patrick's Day is celebrated by Irish people around the world as a celebration of their national heritage, and is increasingly celebrated by non-Irish people as well. Celebrations include the wearing of green clothing, and there is a tradition of pinching those who do not comply with this dress code! In the USA Americans celebrate Saint Patrick's Day with parades, Irish music, food, drink and dance. Saint Patrick's Day symbols include shamrocks, leprechauns, rainbows, harps and other Celtic and Irish symbols.